The New England Foundation for the Arts (NEFA) is a grantmaker, program initiator, aggregator of resources, and builder of creative partnerships among artists, arts organizations, and funders. NEFA develops and manages arts initiatives on local, regional, national, and international levels. What was the impetus for NEFA’s creation? NEFA was founded in 1976 with funding from the National Endowment for the Arts as one of six regional arts organizations created to strengthen the arts infrastructure in America. Cultivating the arts on a regional level – in partnership with the six State Arts Agencies of New England--still remains a major focus for NEFA. One of NEFA’s programs, National Dance Project (NDP), was launched in 1996 to encourage the creation of new work in dance that would be shared with audiences in communities throughout the United States. NEFA looks forward to a future of dance that continues to explore, inspire, and reflect our changing world. Our role is to deliver a cohesive package of support so that artists have the necessary tools to develop, experiment, and take risks in their work. We also work to provide resources to artists and presenters alike so that new dance works may be created and performed nationally and internationally - and in ways that strengthen artist/ presenter partnerships. 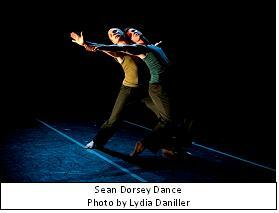 Which recent dance grant recipients do you and your staff find inspiring and why? They all are! But if we have to select a few, here are three that were just recently awarded NDP Production Grants and Touring Awards. Carmen De Lavallade (NY) – Legendary artist who has had a full and illustrious career that spans over six decades. She is creating a new piece that mines and reflects on her previous work through film, dance, and her personal stories while exploring movement for an older artist. Audiences will be privileged to see De Lavallade herself perform in an inventive retrospective in the first-person. Sean Dorsey Dance (CA) – As a transgender choreographer leading a multi-generational Lesbian, Gay, Bisexual, and Transgender (LGBT) ensemble, Dorsey authentically represents and uses storytelling, theater, and dance to shed light on otherwise hidden stories of the LGBT community. Dorsey works deeply within these often overlooked communities to develop his work through an intensive process of interviews, and workshops and creates genuine relationships with the individuals whose stories inspire his work. Rosy Simas Danse (MN) – Native American contemporary choreographer Rosy Simas (Seneca) is a first-time recipient of an NDP grant; she is embarking on an ambitious new work and her first national tour. Her work blends sound, movement, lighting, and film to explore themes of ancestry, homeland, and displacement, and how these ideas live within the body. Simas is particularly interested in bringing this work to Native communities across the U.S.